User Tracker Count: 94 times. This is a basic swinging ship ride. There is very little theming. It is fun, rerideable, and has a large capacity. The ride cycle is also very short. This is a very poorly run swinging ship. 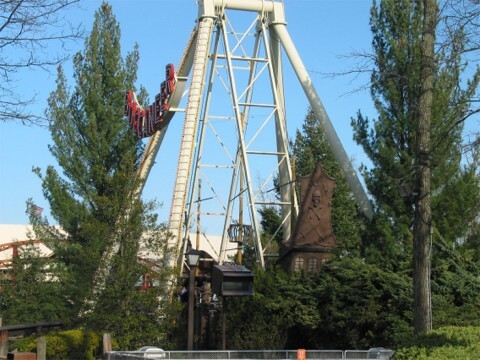 There is only one that I have been on that has been run worse, and that was the one at Hershey. The ride is slow, it does not swing very high and the cycle is pretty short. It is all around bad and is just another flat at the park. The location is poor and the ride is bad. I HATE swinging ships. This one isnt too bad, but is a weak ride compared to ships at carnivals and fairs. Ive ridden much better pirate ships that continue to push more upward, and they went like that for about 5 swings, and then slowly rested. This one was OK, but it was kinda boring and short. Ill give it a six because Im just a weighlessness kind of person. Fun if you sit at the very top.. but if you dont its really boring and seems very slow & short. This was an okay ride. I was expecting it to go a lot higher than it did but it was still okay. Swinging ship rides are usually fun, especially in the back. But not this one. This is the slowest and lowest swinging ship i have EVER been on. Its even boring in the way back! I think I know why, its because the tire slows down the ride on every swing, and its only supposed to stop it. This ride is 100x better at a carnival! A basic swinging ship this ride is run too short but normally has no line.